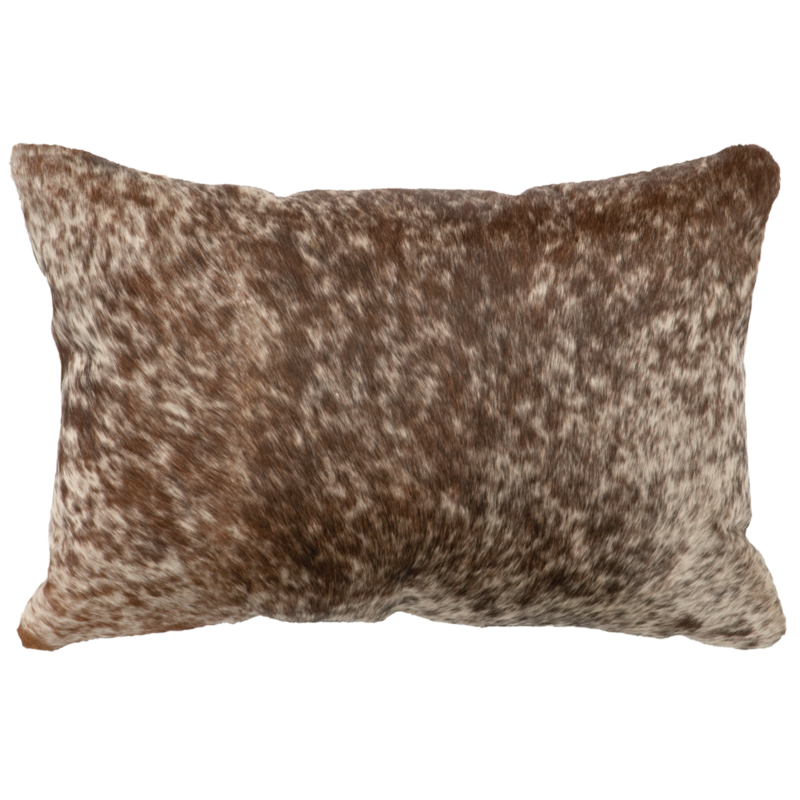 Hair on Hide pillows can add a small pop of urban ranch to a contemporary home or fill it up with a full western look. Disclaimer: each hide is unique and color, shading, pattern, hair length variances are to be expected. #WD1658FB - 16" x 16"
Hair on HIde four square with leather square border and Chocolate Suede fabric back. Miscellaneous Light Brown Speckled and Brindled Hair on Hide and solid leathers. #WD1952 / #WD1952FB - 12" x 18"
Dark Brindled Hair on HIde. #WD80308 / #WD80308 - 12" x 18"
Speckled Hair on HIde with leather fringe and bands with decorative conchos. #WD80313 / #WD80313FB - 16" x 16"
Four sectioned Light Brown Speckled Hair on HIde. #WD1498 / #WD1498FB - 16" x 16"
Dark Brindled Hair on HIde bordered with Mesa leather and decorative studs. #WD1661FB - 12" x 18"
Brown Hair on HIde and leather squares with Chocolate Suede fabric back. Miscellaneous Dark Brown Speckled and Brindled Hair on Hide and solid leathers. #WD80310 / #WD80310 - 12" x 18"
Dark Brown Speckled Hair on HIde with Texas leather sides, floral rope conch and antique brass studs. Light Brown Speckled Hair on HIde weth leather fringe and bands with decorative conchos. #WD1700 / #WD1700FB - 16" x 16"
Four sectioned Dark Brindled Hair on Hide. #WD80235 / #WD80235FB - 12" x 18"
Dark Brindled Hair in HIde with Mesa Espresso leather straps and buckles. #WD1949 / #WD1949FB - 12" x 18"
Dark Brown Speckled Hair on Hide. Light Brown Speckled Hair on Hide with Whiskey leather edges. Decorative conchos and studs. #WD706 / #WD706FB - 12" x 18"
Dark Brindled Hair on HIde with Black leather and conchos. #WD80317 / #WD80317FB - 16" x 16"
Dark Brown Speckled Hair on HIde with Texas leather corners and antique brass studs. #WD80319 / #WD80319FB - 16" x 16"
Miscellaneous Dark Hair on Hide and solid leathers. Light Brown Speckled Hair on HIde. Dark Brindle Hair on Hide with Texas leather edges. Decorative conchos and studs. #WD775 / #WD775FB - 16" x 16"
Four sections Dark Brown Speckled Hair on HIde. Light Brown Speckled Hair on HIde with Whiskey leather corners and antique brass studs.